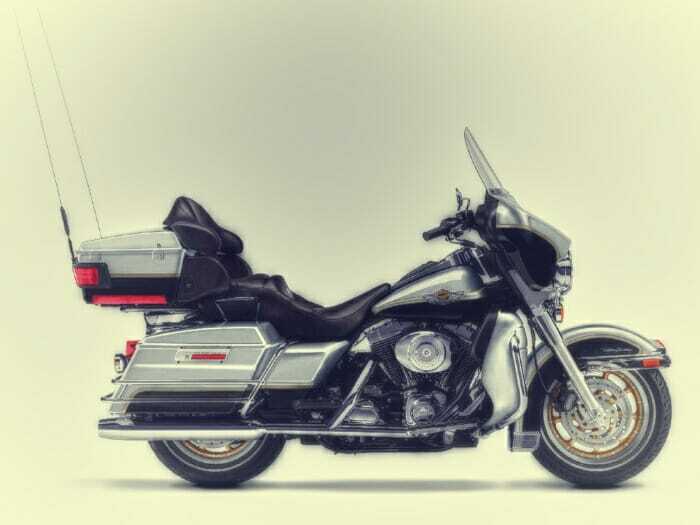 If you’re planning a long distance, multi-week tour with a pillion and luggage for two, the Harley Davidson Electra Glide is the bike we’d recommend. The Tour-Pak has an integrated backrest which cradles the passenger, the pillion seat is roomy, and the wide, flat floorboards are a stable, comfortable place to rest a pair of feet. Pillions often fall asleep on the back of this bike, it’s so comfortable! This is a big bike (864 pounds OTR), but the seat height is fairly low (29.1 inches) and as such experienced riders will find the Electra Glide quite controllable even at parking lot speeds. The six speed gearbox provided relaxed cruising even at elevated highway speeds. A six gallon tank easily provides 200+ miles of touring range. Luggage capacity on the Electra Glide is superb, with the Tour-Pak and two hard saddlebags, all of which lock. We’ve never had water leak into these cases, even in the heaviest of downpours. The batwing fairing provides excellent protection from wind and rain, although sometimes it can get a bit stuffy for the rider in very hot temperatures. These bikes usually come with a CD player and an input for your MP3 player, weather band radio, and sometimes cruise control too. These amenities may not be that big a deal on a day ride, but if you’re on the road for weeks, they just make life on the road a lot more pleasant. In fact, we used one of these bikes on our 2011 Coast To Coast tour – Boston to San Francisco, 4300 miles in 15 days. The Electra Glide never skipped a beat, and we were fresh even after 400 mile days in the saddle. For long distance touring with extended days in the saddle, the Harley Davidson Electra Glide Classic is probably our favorite choice in the EagleRider fleet. Interested in hiring one?